A great recipe to celebrate a Happy St. Patrick’s Day! 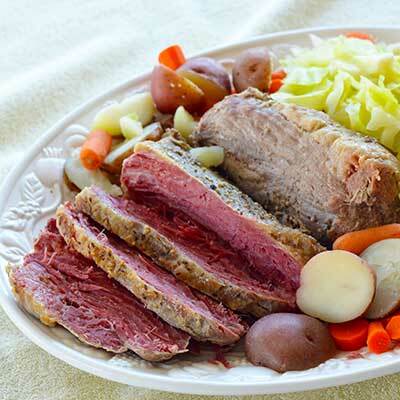 Place corned beef in Dutch oven; sprinkle seasoning on top of meat; add enough hot water to barely cover. Bring to boil. Scrape off any foam that may form on the top. Cover and simmer for about an hour per pound, or until fork tender. I usually use the fork test as I cook several cuts of meat at once. They all shrink and they all cook differently. Remove meat from hot water. This liquid is then used to cook your potatoes, carrots and cabbage. I usually have a couple of pots going and put the carrots in one and the cabbage in another. The potatoes can also be cooked in this fashion but I usually have prepared them ahead of time and have them warming somewhere. While vegetables are cooking, glaze the meat. This will give you a nice moist, flavorful cut but without all the fat. Slice most of the fat off of the meat and lightly spread the fat side with nice brown, seedy mustard (several brands available in your grocery store). Then sprinkle with a mixture of 1/4 cup brown sugar and 1/4 teaspoon ground cloves. Bake in shallow pan at 350°F for 15-20 minutes or until nicely glazed. Always cut corned beef against the grain. Eat and enjoy and Happy St. Patrick’s Day! Barbara Rider is part of a 5th generation farming family in the Pajaro Valley. Barbara and husband Jim are apple growers, but in the past also operated a flower growing business. Barbara has been active in the Farm Bureau plus a past board member for the organization Agri-Culture. She is also a two-time winner, 1993 & 1998, of the “Best of Show Apple Pie” in the Farm Bureau’s Annual Apple Pie Baking Contest held during the Santa Cruz County Fair. Barbara is an excellent cook and I’m sure you will enjoy all of her wonderful recipes.